Catastrophe is a Greek word. It is especially apt for the Greek pension system. That never achieved sustainability; it increased poverty and inequality, but gave little security at old age. Even so, it managed to bankrupt the country and to undermine two bailout programmes from 2010 to 2014. In 2016 it was poised to derail the third. Reform proposals in 2016 were structured around implementing common rules. Consolidation was to operate in three dimensions: Across generations, across occupational categories (i.e. between wage employees and the rest) and in administrative structures. Those proposals repeated the key idea of a detailed 1957 policy paper, written by the mother of an Economy Minister of the late 1990s: “There is urgent need of a system … free of the unacceptable position that its objective is to secure privileges of the few against the many, which will use the available means to meet needs”. (quoted in Tinios 2010). In 1968 due to the dictatorship. In 1978 due to inflation. In 1988 the reform was leaked to the press and then abandoned. In 1998 the ‘Spraos report’ provoked hostile reactions. In 2008 a cosmetic law could not avert bankruptcy a year later. In 2018 is the prospective date of full implementation of the 2016 proposals. Why has the performance of the Greek pension system been so bad for so long? Why is it so hard to bring it under control? What is the role of pensions in the dynamics of the crisis since 2010? I try to elucidate this question by means of three diagrams. The Greek pension system was overwhelmed by the original 1950s ‘question set’, having got stuck on how to combat fragmentation, both in institutions and in insurance arrangements and how to ensure common rules. Fixed on this, Greek society did not realise that the world had moved on. The out of date framing of the question affected the type of reform that was finally passed after the crisis erupted in 2010. This can be seen in the fact that, even the ‘new system’ introduced in 2010 and completed in 2016 was still a 1960s-style, large, State-run, PAYG system. Where the whole of pension provision remained exclusively the preserve of the State. There was considerable policy activism on pensions after 2010. If the problem before the crisis was procrastination and inactivity, 2010 appears as a watershed, when things were finally dealt with. What, before the crisis was talk without action, was replaced by action without talk. Was this change sufficient to correct the problems spotted in the previous section? Unfortunately, Diagram B catalogues that the type of mechanisms which neutralized the capacity of public discussion to spot and correct underlying problems. A combination of misinformation – such as discontinuing statistics, avoidance of discussion, blame avoidance and misrepresentation meant that wrong solutions kept being offered to a problem which was, in any case, misidentified. An example is the repeated use, starting from the Prime Minister and going on to Oxford-educated ministers, of the nonsense argument: “pensions should not be cut, as grandparents give pocketmoney to their unemployed grandchildren”. Even if such a statement were factually correct, it misses two key policy points: (a) It is employed grandchildren that pay for grandparents’ pensions. (b) Why not give benefits directly to grandchildren? Passing the can down the road, was hardly new. There was, however a key difference which was not grasped: Developments in the economic and social environment had accelerated and were, by 2015, dramatically different. Assurances of pension system viability were followed within weeks by a new set of cuts. The pension system was no longer trusted to play its key role – to guarantee income security at old age. Hiding behind the smokescreen of the new-style blame avoidance, a vicious circle remained in continuous operation. The delegitimation of public pensions proceeded unchecked. Halting this race to the bottom needed to win back trust from the insured population. As time went on this could only be done by turning a new leaf: an entirely new system. Such a reform however was prevented from happening. The final diagram asks why. Diagram 3: How to avoid a fresh start. A complete change of system is always a leap into the unknown. This is certainly so for providers, but even more so for the insured population. They need to tear up the familiar contract to replace it with something unknown and, indeed, unknowable. Winning the trust of the population for such a leap is the real task of reform. To turn a new leaf, it is not enough simply to point out to problems, or even to produce a shining new technocratic blueprint. Technocratic insights must be communicated so that people understand both why the existing situation is problematic and how proposals are superior. 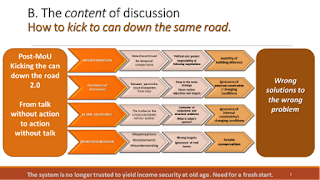 In the case of pensions, discussions has to go through an equivalent process: Studies or actuarial reviews point out problems; public debate translates them so that every person understands what the problems mean for their own particular circumstances. Tinkering within the parameters of the familiar, existing system needs to be shown as insufficient, before the big step of a totally new system is finally implemented. 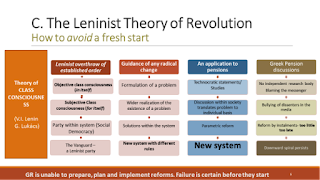 The question of discontinuous regime change in the social sciences has been most extensively discussed in the context of revolutionary political change (for obvious reasons). 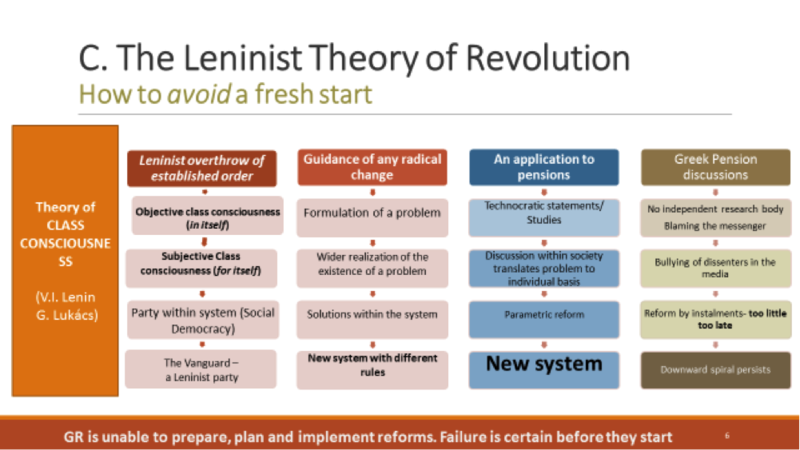 In contrast with neclassical economics and bourgeois sociology which focus on gradual change, the Leninist theory asks what needs to happen for a complete overhaul – arguably what needs to happen for a fresh start in Greek pensions. · Technocratic exercises on pensions are heavily discouraged. No independent research body on ageing exists, while research on pensions receives little encouragement. Reform proposals are seldom discussed, while indiscriminate labelling of reformist views as ‘neoliberal’, ensures they don’t get a hearing. · Unorthodox opinions are subject to heavy bullying by the media: The messenger is blamed for the message, often subjected to personal attacks and invective. This applies both to technocrats and to politicians, who both risk to find themselves in the political wilderness. So, despite a crying need for a refounding of the system, systemic change did not take root – neither before or during the crisis. There was an absence of both reforms – in the sense of fully explained package – but also of reformers – in the sense of politicians prepared to risk their reputations advocating reform. 1. 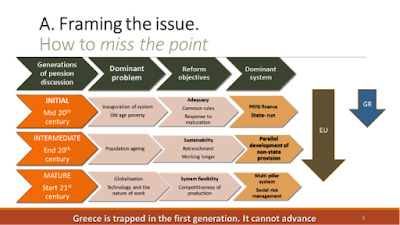 The Greek pension system was never able to correct its ‘original sin’: fragmentation and application of general rules. 2. As a consequence, it missed the fact that the world had changed, and with it, the characteristics of a pension system appropriate to the 21st century. 3. Even after 2010, the troika only began putting in place a revamped 1960s PAYG statist system. 4. The mechanisms of postponement continue to operate after 2010 in a slightly changed form, built around blame avoidance. 5. The need for a fresh start is repeatedly missed. The system sinks in a spiral of ever deeper mistrust. As such it Shifts more of the burden onto next generation and onto production; it creates a 'hole' of insufficient coverage for 40-year olds who will not have enough time to make alternative provisions; it pretends that today’s low pension pensioners can remain unaffected, even after the review that is take place in 2018. As a result the new pension system fits into a zero-sum strategy of redistribution, which is to take place both between generations and between income groups. · Process can overtake content, especially if the reform is drawn out. It is hard to keep one’s ‘eye on the ball’, which needs to be the benefits of reform. · Reforms Need an advocate; however it is not easy to find volunteers. · In Post truth politics it is easier to demolish rather than to build. · Civil society is enormously important. The integrity of the policy discussion community can make the difference between success and failure. Finally, what has happened to Greek pensions could be generalized to any number of serious attempts to change things.